A mysterious, abandoned civilisation is the setting for Lost Island, a 5 reel, 20 payline video slot from Net Entertainment. It comes with wild multipliers that can boost your payouts by up to 5x as well as a free spins feature with frozen wilds and multipliers. Play from between 20p and £100 per spin. The visuals in Lost Island are nicely done. Set against a backdrop full of tropical vegetation and ancient monuments, the reels include lower value playing card values and a selection of objects relating to an abandoned civilisation. They include jewels, necklaces, drums and facemasks. The action plays out to a haunting soundtrack that’s a nice match for the mysterious theme. The flower is the wild and is central to the action in Lost Island – it replaces all other symbols apart from the scatter but more importantly a multiplier increases by 1 every time a wild lands. Enjoy a spin with 5 wilds and the payout will be boosted by a 5x multiplier. Keep tabs on the numbers via the meter in the top right hand corner of the screen. 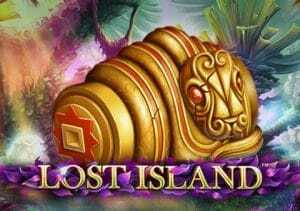 Lost Island also comes with a Free Spins feature which is triggered by landing the gemstone scatter. 3, 4 or 5 of them anywhere on the reels will get you 10, 20 or 30 free spins. The wilds are again integral to the action – 1 wild will be frozen in the middle position of reel 3 on every spin. The wild multipliers remain in play throughout the feature too, offering chances of boosting your payouts by up to 5x. You can re-trigger more free spins here too, with up to 60 available in total, so hope to see the gemstone scatters roll into view. The gameplay in Lost Island is pretty simple – the best chance of winning big come via the multiplier wilds. We found the free spins to be a real hit and miss affair, sometimes missing completely but cashing in on other occasions. Overall, we’d put the variance in the medium range with maximum wins of 2,500 times your stake per spin. It may not be the most exotic video slot you’ll come across but there’s enough on offer from the wilds to make this Lost Island worth a visit. If mystery if your thing, NetEnt’s Secrets of Atlantis is one to try.